Conn. Gov.-elect Ned Lamont listens to U.S. Sen. Richard Blumenthal as they visit Homes for the Brave, a Bridgeport-based nonprofit providing housing and services for veterans and others in need. Connecticut Governor-elect Ned Lamont said one of the first things he’ll do after he is inaugurated on Wednesday will be to reach out to state workers. Lamont, a 65-year-old Greenwich businessman who is coming to state government for the first time, said soon after the fanfare of his inaugural he’ll go visit some of the state’s departments and agencies. 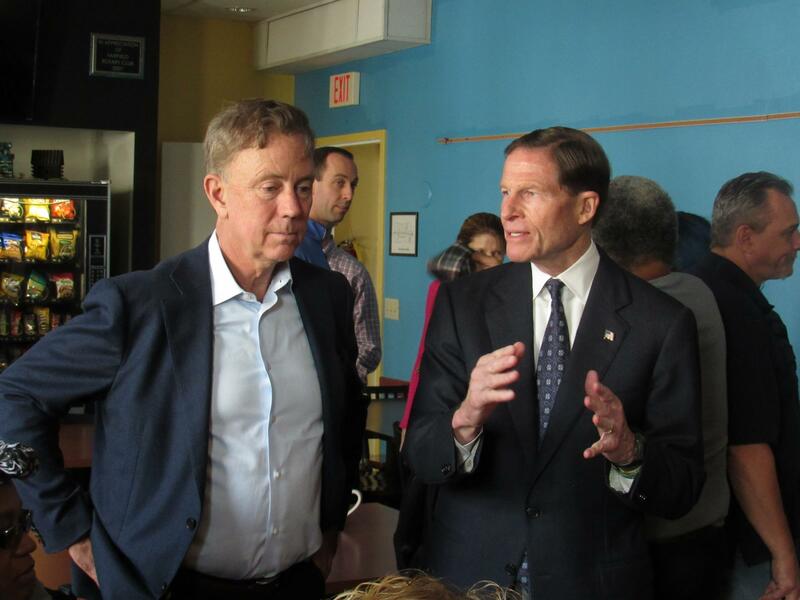 Lamont was speaking during a visit to Homes for the Brave in Bridgeport, a non-profit that provides accommodation and services for veterans. It was one of several non-profits he visited across the state on Sunday in an effort to highlight the work of such agencies. Lamont also said he’s had a look at the state’s books and will have a budget plan ready to be presented to the state legislature in February. Connecticut has a surplus this year but faces a projected $1.7 billion deficit in the next two years. Lamont has promised not to raise taxes. Instead he said he’d like to have highway tolls for tractor trailers, and to legalize and tax the recreational use of marijuana. Lamont’s inaugural in Hartford on Wednesday will include his swearing-in, a parade, a speech to the legislature, and an inaugural ball. Copyright 2019 WSHU. To see more, visit WSHU.